Pelosi Knows How to Play Chicken. Trump Doesn't. (Bloomberg Opinion) -- On Tuesday, President Donald Trump invited a bunch of Democrats to the White House in hopes of splitting the party. Not only did he fail to break Democratic unity, but none of the invitees even bothered to attend. Trump had a little better luck on Wednesday, when the bipartisan "Problem Solvers Caucus" came over, though Democrats in the group seemed more interested in giving him the message to reopen the government than they were in negotiating anything right now. 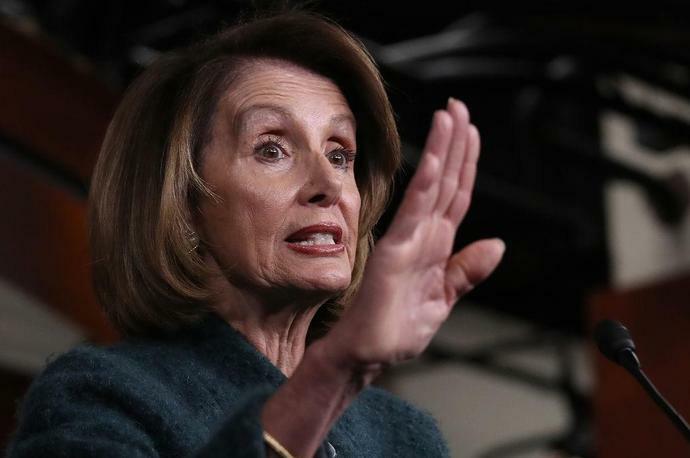 House Speaker Nancy Pelosi struck back on Wednesday by postponing Trump's trip to Capitol Hill for the State of the Union Speech. Pelosi even suggested that Trump might want to consider reviving the pre-Wilsonian tradition of submitting a report in writing instead of a televised speech. For one thing, as the HuffPost's Jennifer Bendery writes, this is "classic Pelosi." There's little question that the speaker knows how to negotiate - and how to fight. Closing the government has been Trump's idea from the beginning. He wanted a shutdown to pressure Congress to give him his border wall; Democrats, and many Republicans, were perfectly satisfied with the government spending agreement they had negotiated. Indeed, Trump wanted the shutdown back in September, when the spending bills were originally due, and then he wanted it in early December, when the extensions ran out. Republicans were able to convince him the first two times to go along, but he balked when the latest temporary bill ran out. If Trump's explicit claim of responsibility isn't enough, then surely his opposition to the Democrats' bills aimed at keeping the lights on while negotiations continue is a pretty clear indication that he wants the shutdown. And presumably he wants it because he thinks it will increase his negotiating leverage. But that's not what's happening. Democrats are the ones constantly emphasizing the suffering of government workers either furloughed or working without pay, of government contractors who won't get paid, and how everyone else is losing out, too. Trump and his administration that are downplaying the effects. But if they are correct, then why should Democrats accept a worse deal than the one they had already negotiated back when they didn't yet have a House majority? The answer might be that the side that caused government closures is always going to be the one that takes more blame for the effects. If that's the case, however, it's a good reason to never shut down the government as a negotiating ploy, because it's certain to backfire. Or perhaps it's even worse: Trump is listening to those who believe that government is all waste, fraud, and abuse, and that shutting down part of it will somehow reveal how great a libertarian paradise would be. For such people, the border wall is irrelevant; it's just an excuse to maneuver a bunch of agencies to close. Ed Kilgore had a good item about that kind of delusion. It's simply not true that modern U.S. society can get by on a tiny, 19th-century-style government, and certainly not one imposed willy-nilly through a sudden extended government shutdown. In any case, it's still just as hard to see how this ends well for the president. He should be looking for the least harmful escape route, but so far it's not even clear he realizes he's played himself into an impossible position.